The Samsung W799 is a new clamshell phone from Samsung which will be available soon in China market. The Samsung W799 phone is being designed to support tri-band GSM and 3G CDMA2000. 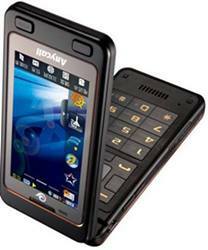 The phone is featured with two 3-inch touchscreen displays with 240 x 400 resolutions. Both of the screens have been designed to support handwriting input and TouchWIZ UI for improving mobile experience. The touchscreen phone is equipped with a 5-megapixel auto-focus camera with flash function. Beside that, the phone has been enhanced with secondary video camera for video calls. It boasts A-GPS navigation for turn-by-turn directions, integrated FM radio for users to enjoy their favorite songs while on the go, supports office documents, comes with 300MB of internal memory, TV-out and DivX. In addition, it is Bluetooth enabled and supports up to 16GB of microSD card. The new Samsung W799 is expected to be available in the China consumer market via the CDMA operator, China Telecom.